Before the holiday season and the resulting trip to the dentist, Bubba was just starting out on his epic Route 66 road trip. On this leg, he was starting in Oklahoma and heading west. The goal was to find, and drive on, as much of the old road as possible. We picked up at the same location as we stopped the year before, even staying at the same hotel. The hotel we stayed at in Broken Arrow, Oklahoma had suffered over the last year. The restaurant next door was closed so the country western Karaoke we “enjoyed” last year would not be on the agenda. The in-hotel night club was also closed. Well, this was a weekend so I guess…I don’t have an excuse for them. Our first stop on the 66-11 tour was Catoosa, Oklahoma. This is where we left off last year. We revisited the Blue Whale. He was glad to see us again as you can tell from his big grin. This is a Rt. 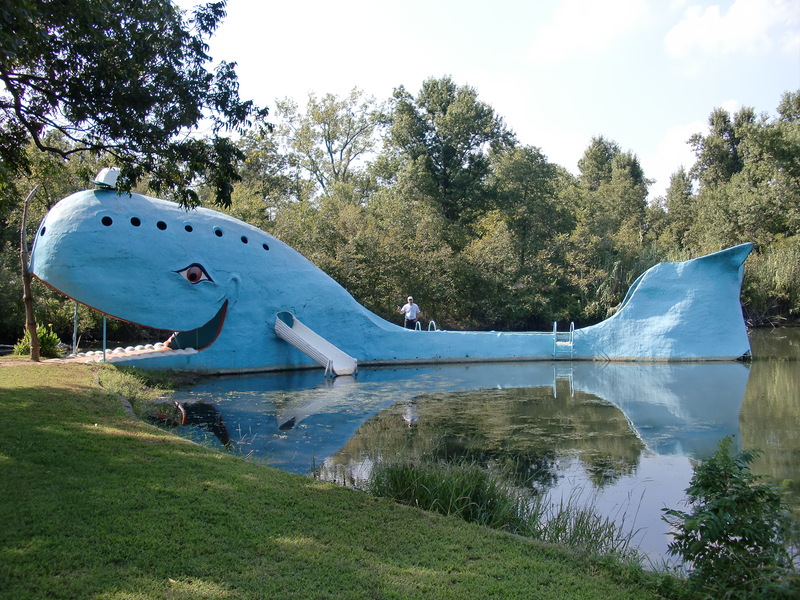 66 landmark that is in a “swimming hole” in a small park. You can use the tremendous waterslide on the side or do a little tail diving. You have to be careful of the aquatic plants and unidentifiable things that now clog the pond. 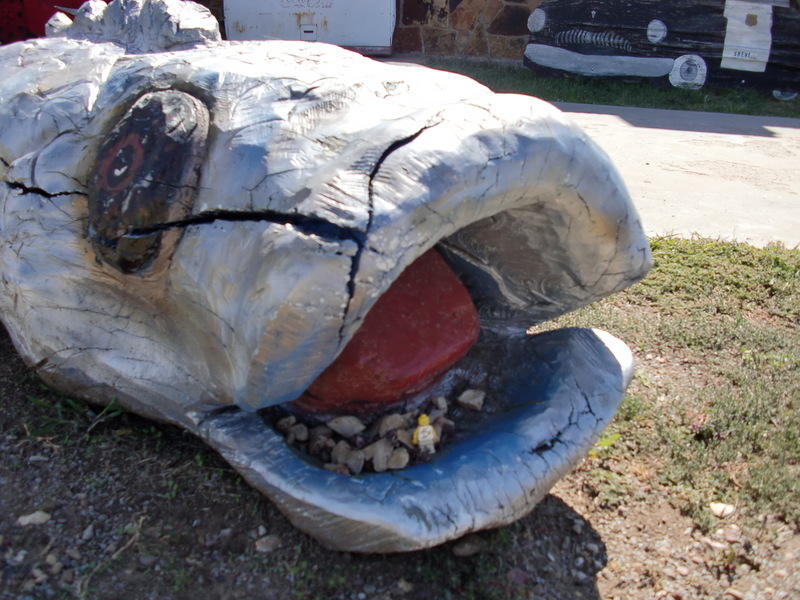 The Catoosa whale is one of the Rt. 66 giants. Tracing the old route should bring us to many of the sights and attractions from the years past. 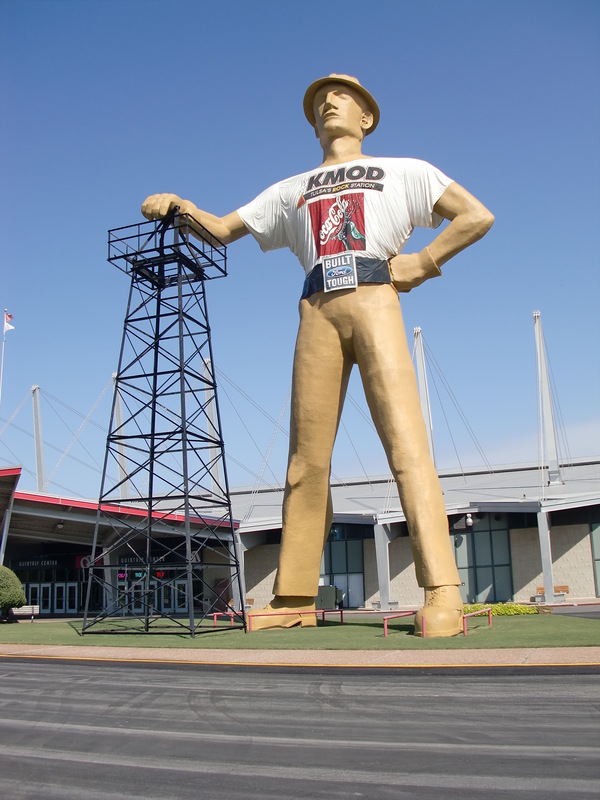 We motored on to Tulsa where I posed for a picture with this guy. Another giant! I had to find a safe place to stand. This guy was big!! Can you see me? It was hard to get us both in the picture. I’m sitting on the shoelace on his left foot. Yeah, there I am. I thought maybe the best way to stay out from under his foot was to sit on top of it. A glance, some pictures and we hit the road again. We had to pretty much stay on the new road that was put down in 1952 in this location. It was the up-to-date modern two laner road. 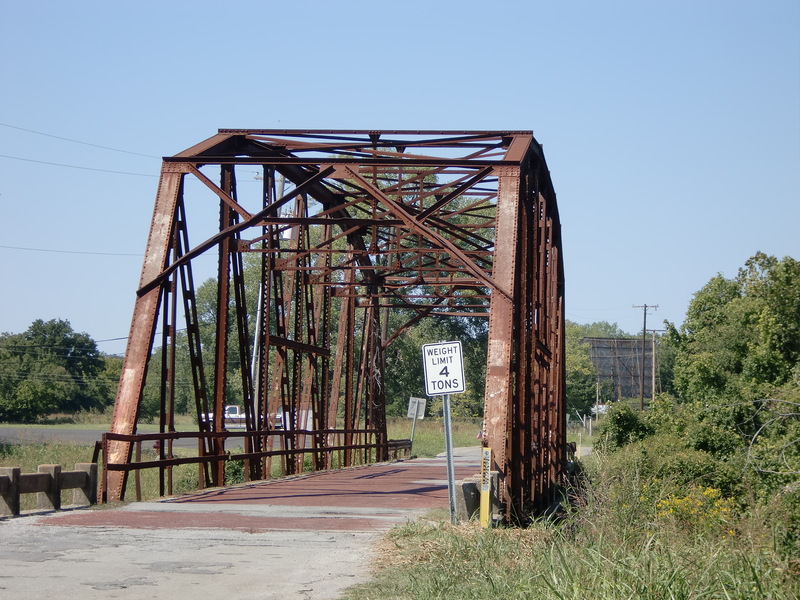 We finally found a spur of the original road from 1926 and carefully crossed the bridge. I’m glad we had a small car. 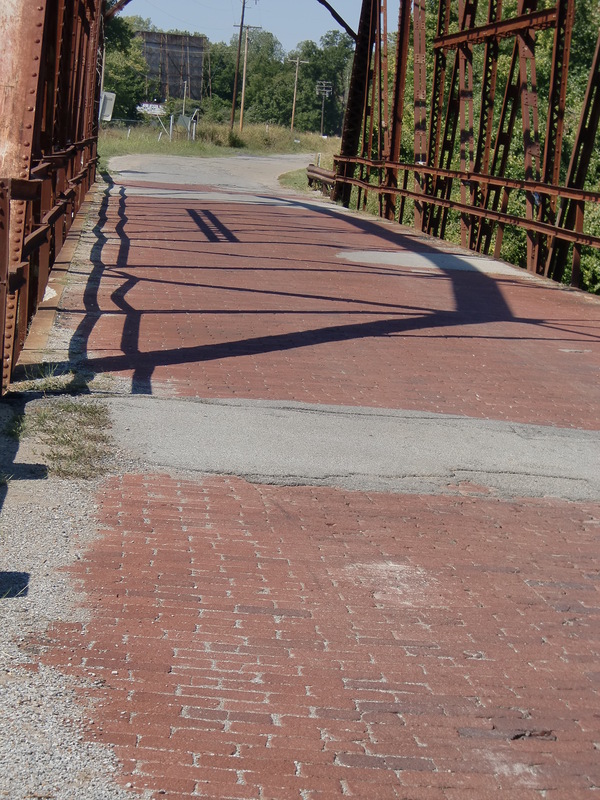 The bridge did have a nice brick floor to it. There are some odd traditions that have come down over the years. One is the Shoe Tree. 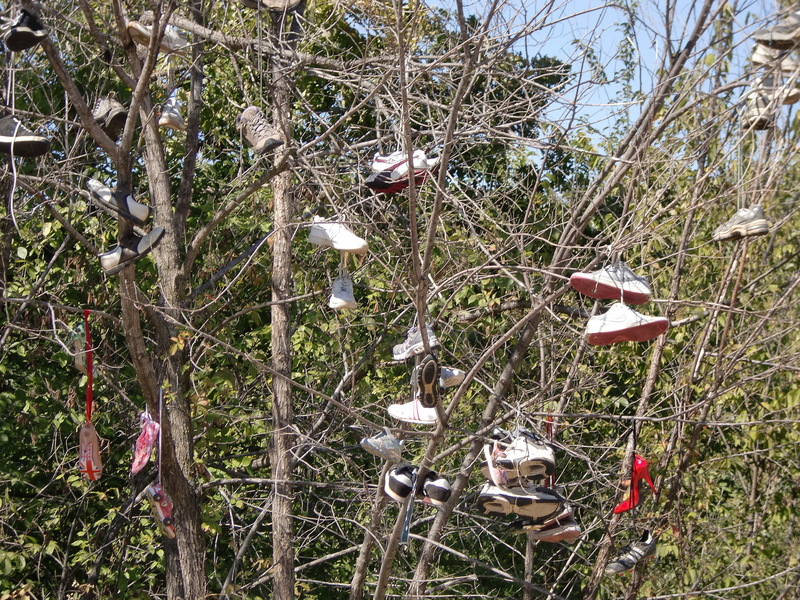 For some strange, demonic possession type reason, people stop, write on their shoes, and leave them in this tree. One shoe in particular caught my eye and I tried it on. JUUUST a little too big. 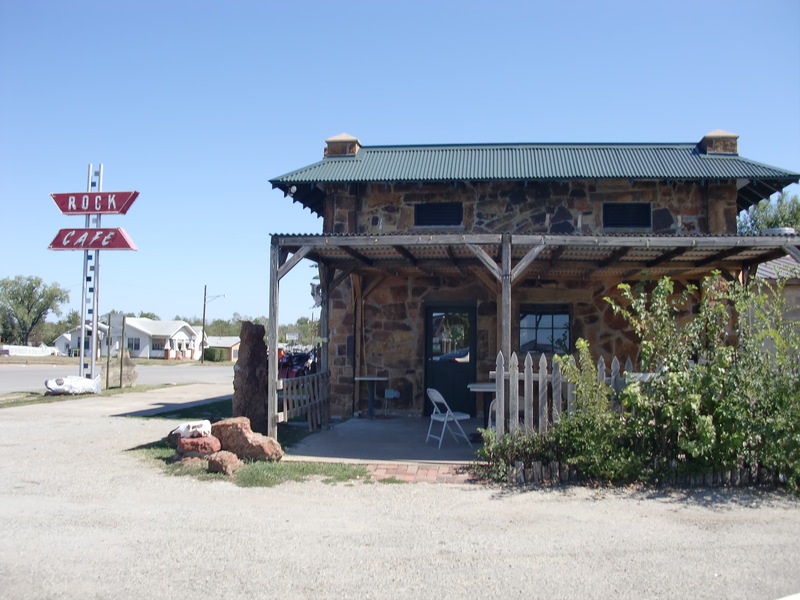 We then stopped at the Rock Café in Stroud Oklahoma. 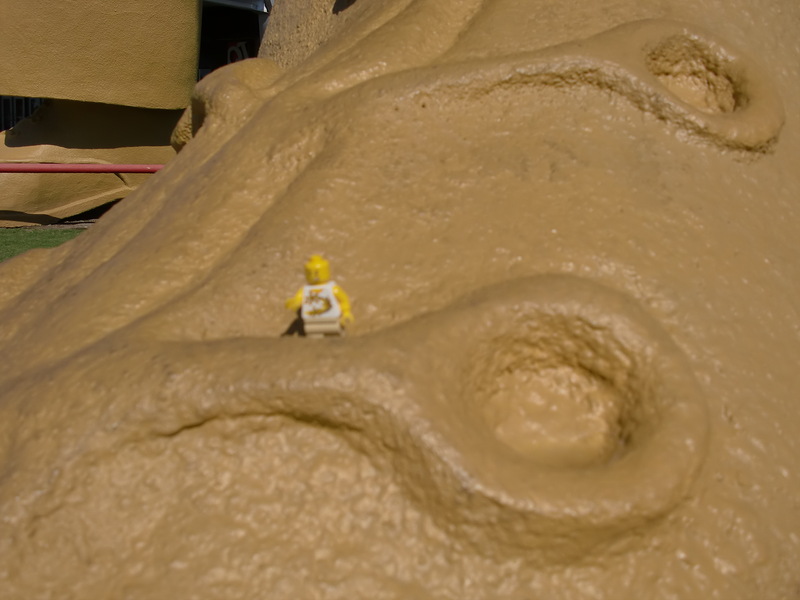 This landmark was built in 1939 from rock excavated when the Mother Road was built. The grounds are strewn with curiosities to tempt the weary traveler to stop and feast. I had a quick chat with a fish that was sitting outside waiting for a table. Since we saw his name on the menu, we decided to get back in the car and move on. Rick was getting a little tired so he let me drive the rental car. I had a little trouble parking it at the next stop. I’ll try again another time. 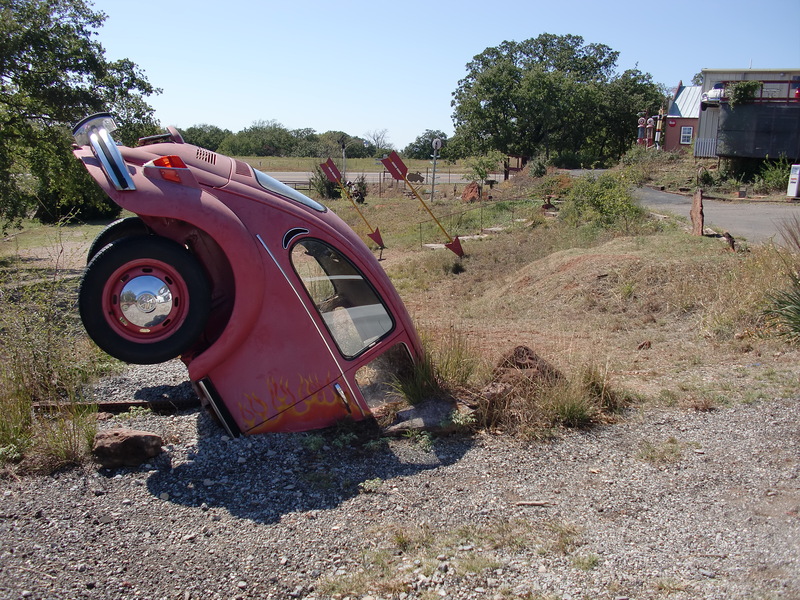 This entry was posted in Holiday, Humor, Legos, Oklahoma, Road Trip, Route 66, Travel, Uncategorized and tagged Catoosa, Rock House, Shoe Tree, Tulsa. Bookmark the permalink. Bubba, I’m so envious. Enjoy the rest of your trip along 66. Make sure you stop in Gallup, New Mexico and visit some of the Indian shops there. You’ll find our people are so friendly. Say, “Ya-ah-tey” to our Navajo brothers and “Keishi” to our Zuni cousins. Since you were in Broken Arrow, :O-si-yo” would have gotten you a smile from the Cherokee there. Continue to have a safe trip, though you really need to work on your parking skills. I thought I was bad! 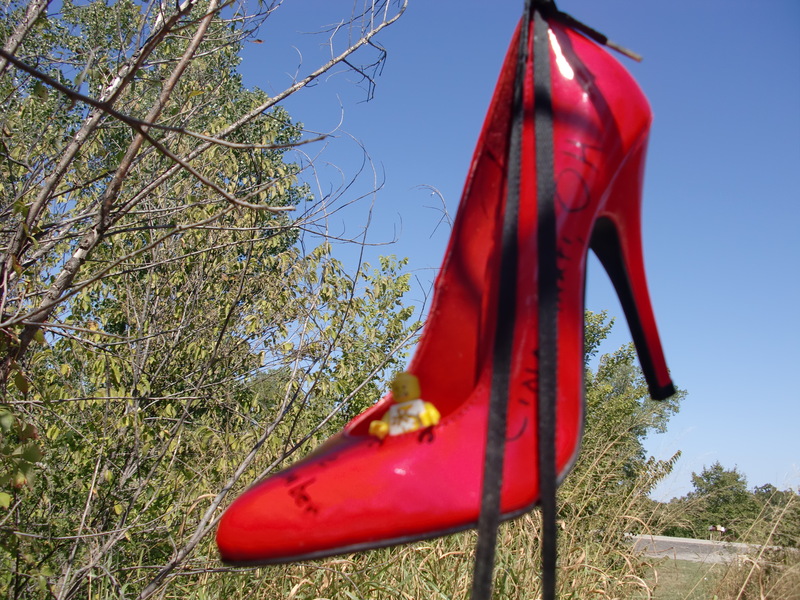 I can totally see MY shoes left on the shoe tree in September 2011 🙂 Thanks!